If you qualify for an Avant personal loan, you can get your money quickly. Avant funds personal loans within 2-3 business days, while several other major lenders may take a week or longer. 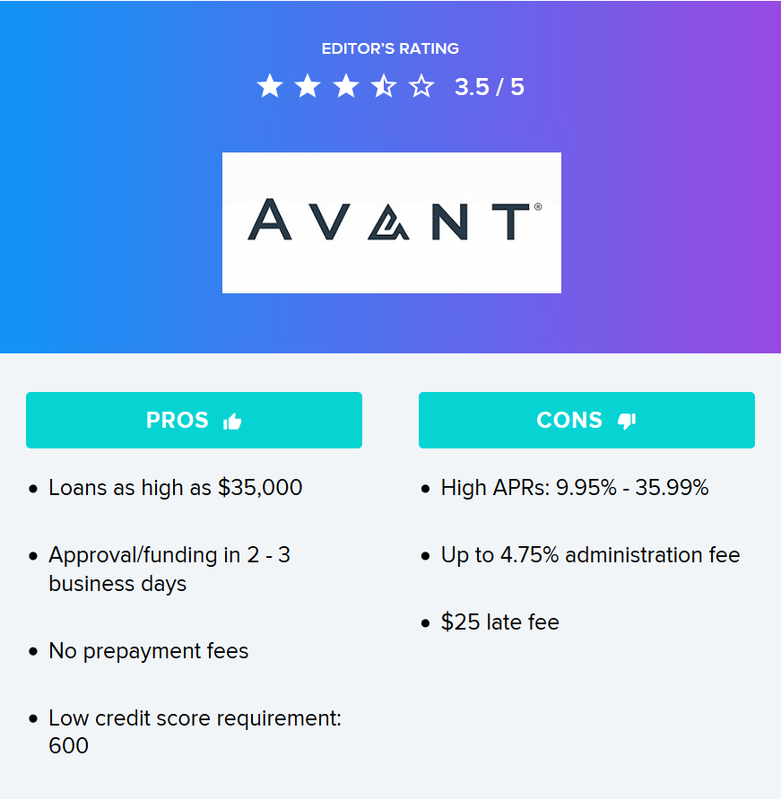 Read on to learn more about Avant loans and see how they stack up against the competition. Avant loan rates are between 9.95% and 35.99%. That’s just about the highest maximum rate you’ll find on the market, and the lowest possible rate is still fairly high. Many comparable lenders start their interest rates around 6% - 7%. And plenty of other lenders have interest rate maximums of 18% - 25%. Every Avant personal loan APR is fixed, so it won’t change as long as the loan is open. The one major fee that Avant loans have is an “administration fee.” It’s a fee for processing the loan, so it’s the same type of fee that other companies call an “origination fee.” This fee can range from 0% to 4.75% of the loan amount and will be deducted from the initial amount you’re given. The fee that you personally pay will depend on a variety of factors such as the loan amount, loan length and your credit. Avant does not have a fee for paying off your loan early. The late-payment fee is $25. The Avant loan credit score requirement is 600 or higher, according to a representative. That’s one of the lowest credit requirements among popular personal loan providers. Avant does not disclose any minimum income requirements, but they do say that you must be at least 18 years old and either a U.S. citizen or a permanent resident with a Social Security number. You can check your loan options with Avant online after filling out some personal information – your address, income, desired loan amount and more. In the process, you will also create an account on the Avant website. After this pre-qualification process, you will have the opportunity to apply online. This is the only way to apply. Avant has a good reputation with watchdogs like the Better Business Bureau and the Consumer Financial Protection Bureau. There are very few complaints about their personal loans. Better Business Bureau: The BBB gives Avant an A+ rating. Avant has been accredited since 2015. Consumer Financial Protection Bureau: There are less than 400 complaints registered against Avant with the CFPB. Of those, 153 are about personal installment loans. Some recent complaints include Avant reporting inaccurate information to credit bureaus or interest rates being excessively high. Avant has given a response to all existing complaints in a “timely” manner. WalletHub: WalletHub’s editors give Avant personal loans 4 out of 5 stars. Avant has a high degree of transparency, as their personal loan terms are readily available on their website. In addition, they do disclose minimum credit score requirements. WalletHub’s editors rated Avant personal loans by using 23 metrics in 7 categories: loan requirements, APR, fees, the application process, loan amounts, customer satisfaction and transparency. We gave higher priority to certain metrics that had more of an impact on the borrower. Below, you read about all of the different factors we measured. Requirements: WalletHub considered the required credit score and income for an Avant loan, along with Avant’s citizenship and identification requirements. APR: We researched Avant’s minimum and maximum APRs, and checked whether they are fixed or variable. Fees: We checked the fees involved with taking out an Avant loan, such as origination fees, prepayment penalties and late fees. Loan amounts: We looked at the minimum and maximum loan amounts Avant offers, plus how many months borrowers have to pay them back. Application process: We found out all the ways to apply, along with whether Avant allows co-signers. We also checked whether Avant offers pre-qualification, how long it takes to get approved and how long it takes to get funded. Customer satisfaction: We read up on Avant’s BBB rating, complaints filed with the Consumer Financial Protection Bureau and WalletHub user reviews. Transparency: Our editors looked at how clear Avant is about their loan terms and requirements.